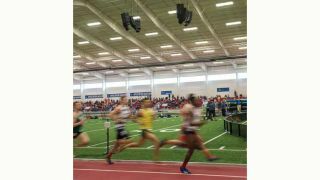 The bar for college sports has risen—with so many uses for field houses, higher-ed sports facilities are now looking for concertgrade sound to accommodate their needs. Such was the case at Pittsburg State University (PSU) in Pittsburg, KS, where Kansas Citybased Reliant Media Systems was brought in to design a sound system that was concert-ready at the Robert W. Plaster Center. A VUE Audiotechnik audio system was installed at the new Robert W. Plaster Center to allow the school to use the center for multipurpose events, all with a concert-grade sound. The main role for the Plaster Center is to serve as a field house for track and field events. Traditionally, these types of facilities only need a distributed audio system, but Pittsburg State wanted something a little stronger. Of course, designing a sound system of this magnitude met some structural challenges. What Reliant Media Systems and VUE came up with was total solution that included a background music system in the weight room, and a full, concert-grade sound system in the field house, which can be reconfigured for other events like graduations, local events, meetings, and more. In the main field house, VUE Audiotechnik al-8s, al-4s, and al-8 subs were used, with BSS processing, and a Soundcraft Si Performer soundboard to control the speakers.